Born at La Prairie, Quebec, 26 September 1849, son of Leon T. Cherrier and Lena F. Viandit (L’Esperance) Cherrier. Educated at the College of St. Therese de Bainville, Laval University (BSc), 1871. Ordained in 1874, Professor of Literature and afterwards Natural Science, St. Therese College for some years. Came to Manitoba, 1878 and became Cure d’Office, St. Boniface Cathedral, 1878-81; since which time, Rector of the Church of the Immaculate Conception. President, College St. Boniface, 1881-1884; appointed to Provincial board of education, 1878, and remained a member until board’s abolishment, 1890. 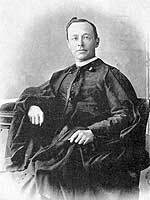 Was the nominee of the Secular Clergy for the Archbishopric of St. Boniface, on the death of Archbishop Tache in 1894. Member of the Provincial Board of Education from 1878 until it ceased to exist; Member of the Royal Commission to inquire into and make recommendations respecting Manitoba University, 1907; Vice-Chancellor, Manitoba University. Address: 191 Austin Street, Winnipeg. The University of Manitoba awarded him an honorary doctorate in 1913. He died on 8 June 1935. He is commemorated by Cherrier Street in Winnipeg.